Toshiba has announced two new portable notebooks, the Toshiba Satellite Pro L630 and the Mini NB250. Let's check out the Mini NB250 first. The 10.1-inch netbook measures 25.4mm at its thinnest point and weighs 1.1Kg. Spec-wise, the NB250 is a standard netbook, with a 250GB hard drive, Intel Atom processors and a day-long 8.5 hour battery life that we're increasingly seeing in most netbooks such as the Asus Eee PC Seashell. The Satellite Pro L630 is more professionally-orientated, with Intel Core i3 processors and up, 250GB of storage, impact detection and Gigabit Ethernet. There's also a 13.3-inch 1,366 x 768 display – but sadly only with integrated Intel graphics - full-size keyboard and multi-touch trackpad, as well as an optional port replicator. Both models also ship with some new software - Toshiba LifeSpace, an "elegant programme that enables users to organise day-to-day activities" as well as ReelTime, providing you with a timeline of recently used documents and folders. Neither seems like a must-have though; we're not fans of huge amounts of additional software appearing on new notebooks. 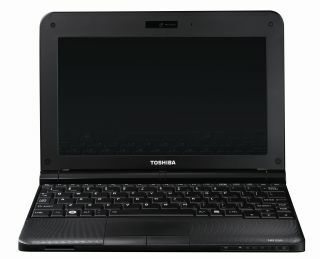 The Satellite Pro L630 and Toshiba Mini NB250 UK release date will be at the end of June.